TechRadar recently caught up with Asus' Corporate Vice President, Eric Chen, in a wide-ranging interview in which the VP of the Taiwanese Eee PC computing giant told us more about his plans for an affordable, touchscreen, 3G-connected tablet computer – the Nvidia Tegra 2-powered Eee Pad. "A slate? Yes, sure. We have the Eee Pad. Which right now is still under development. Basically, it will have an ARM CPU and a 3G connection so you are always connected to the internet, so just like with the Eee Book you are always connected. "And you can choose to play video or something, when you like. Now the key is how to combine the content together. That will be the key. We have studied how people will want to connect to their content and also how they want to interact with the user interface (UI). "You look at the iPhone, for example. The reason the iPhone is so successful – and call quality is really not that good – is the UI function, I think, is just the best. So this is also the way that we need to improve." "We are currently negotiating deals with Telcos and content providers and commercial partners." Swatton would not be drawn on any further details on the Eee Pad's proposed spec or launch date, beyond adding: "We want to be able to offer our consumers that ideal combination of price, specification, functionality and performance [with the Eee Pad]." 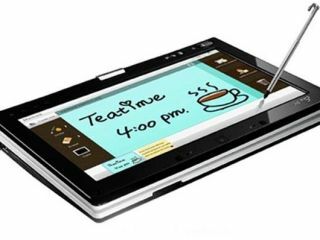 Expect to hear more on Asus' affordable, Nvidia Tegra 2-powered tablet device very soon, with a number of other computing brands sure to follow in Apple's wake, following Steve Jobs finally unveiling his own tablet PC today.